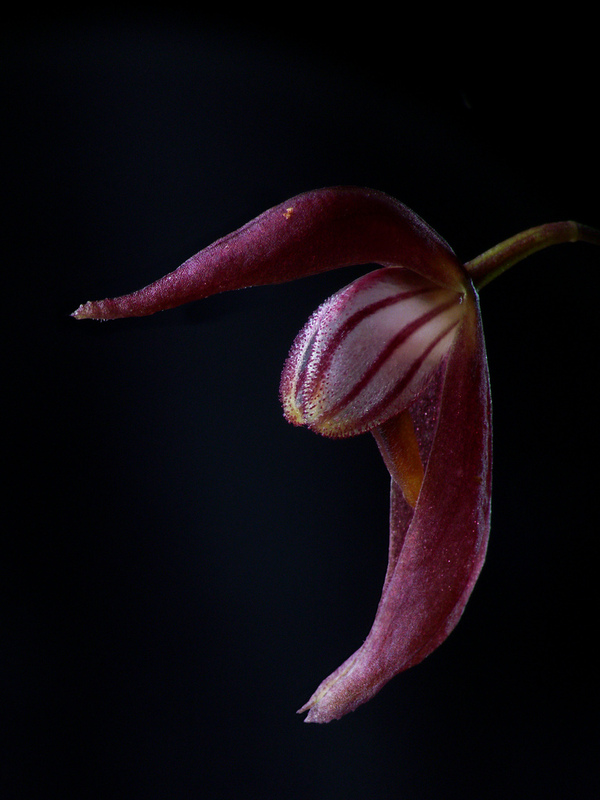 Pleurothallis thymochila Luer 1977 SUBGENUS Dracontia Luer 1986 Photo by © Daniel Jimenez and his Flickr Orchid Website. Found in Panama at elevations around 350 to 1750 meters as a miniature sized, hot to warm growing epiphyte with slender, erect ramicauls enveloped below the middle by a thin, close fitting, tubular sheath and 2 shorter sheaths below and carrying a single, apical, coriaceous, erect, elliptical, obtuse, subsessile, narrowly cuneate below into the petiolate base leaf that blooms in the spring and fall on an erect, slender, subflexuous, 11.2" [28 cm] long, distantly several flowered, racemose inflorescence arising through a slender spathe at the apex of the ramicaul with 2 to 3 flowers open at any one time. Closest to P pachyglosssa but differs in the obtuse, sessile leaf, an inconspicuous spathe, a loose, successively flowering inflorescence with medium sized flowers with rounded, erect basal lobes of a broad, thick, verrucose lip.